Durable features which make it compatible for driving over rough terrain. These motorhomes require the use of a ladder when someone wants to get into the vehicle because of its off-road capabilities. Clearance between the bottom of the vehicle and the ground is high and the heavy-duty tires make it even higher. Interiors of 4x4 motorhomes can contain furniture, beds and other home amenities. Chairs are usually secured and mounted on swivel devices so passengers can face any direction. 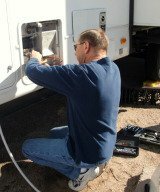 Larger motorhomes may have a shower, toilet, sink and stove, but these types of RVs need to have storage tanks installed to manage the waste issue. Other accessories include retractable awnings affixed outside the 4x4, which can be opened and used as part of the living space when parked. These motorhomes have the advantage of being self-contained because the vehicle and trailer are all one unit. You can walk from the front of the vehicle to the back without needing to stop and get out, which makes is useful when traveling with children. In addition, 4x4 motorhomes are all terrain vehicles, meaning you can drive over just about any type of terrain. Many companies specialize in converting a 4x4 vehicle into a motorhome specifically meant for off-road traveling. They can customize it to your specifications and needs, generally with little difficulty, and most conversions taking about three to five weeks. Vans and Hummers can also be converted into 4x4 motorhomes as well. A professional conversion company will begin by assessing the vehicle which is being converted in order to determine how it should appear after the conversion process is completed. They can build chassis extensions or perform actual body conversions to fit the chassis. This is accomplished by cutting the chassis itself and creating mounts meant for the extension. Mounts are usually rubberized and attached to brackets that have been welded on to the chassis. Most conversion businesses want to validate their work and give lifetime structural warranties to customers in case cracks or breaks occur. Painting and body work is also done by conversion companies. After the conversion process is completed, you can accessorize your motorhome and make it as cozy and comfortable as your own home. In addition to conversion, there is also the mechanical aspect of changing your vehicle over to a 4x4 home on wheels. 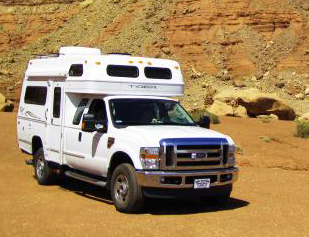 Although the original vehicle probably has many components necessary to drive over any type of terrain, a mechanic who is knowledgeable about all-terrain motorhomes should inspect the converted vehicle and advise as to whether an engine upgrade should be performed due to the extra weight of the conversion. 4x4 motorhomes are a fun and exciting way to explore the country and visit many places most people don't get to visit in their lifetime. With a motorhome like this, you can spend nights on a mountainside or days driving through isolated terrain, with you and your family enjoying the beauty of nature.